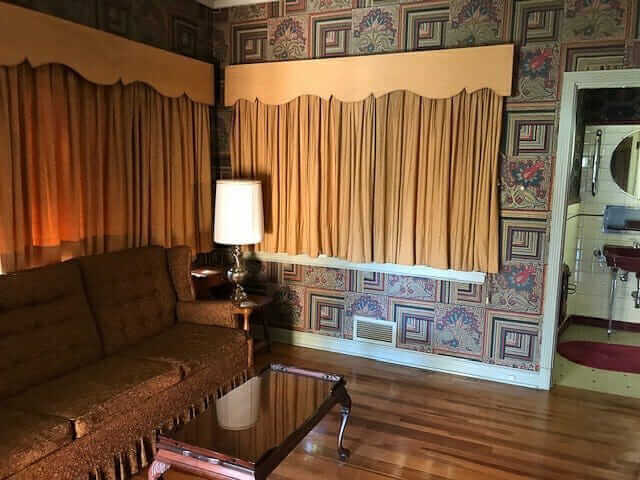 Oh my — the wallpaper is amazing! Pam, This ‘round’ house has great original bathrooms. Gladewater, Texas is a beautiful old town here in the east part of the state. Thought you might like a look at these bathrooms and the wallpaper in this house, before it’s destroyed. This lovely living room would have been very aspirational — magazine-worthy — in 1952. 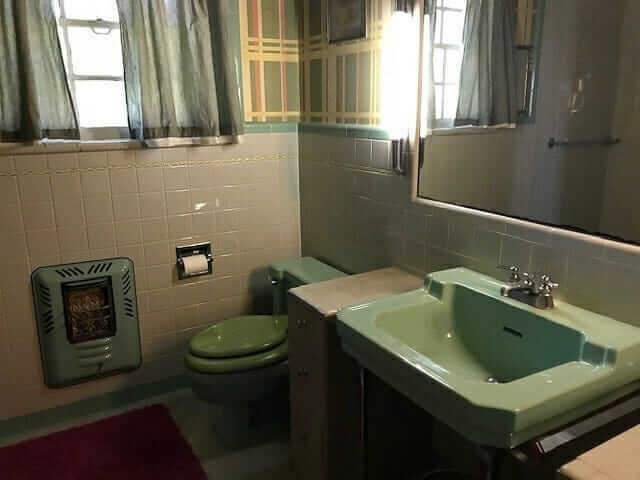 Note the minty-green-painted trim including the recessed nook. This property is one of the landmarks of Gladewater. 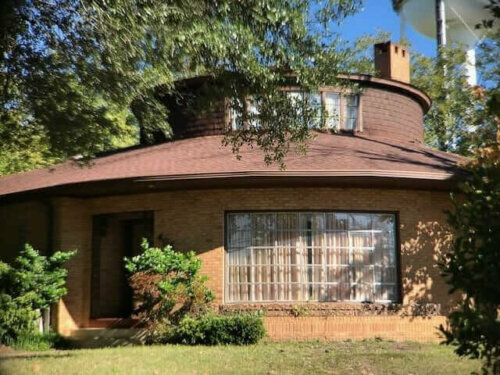 A unique property that features a round design that is eye-catching and a draw for any architecture enthusiast. This grand home is … just a short walk from downtown. Lovely Asian-landscape mural in the dining room. 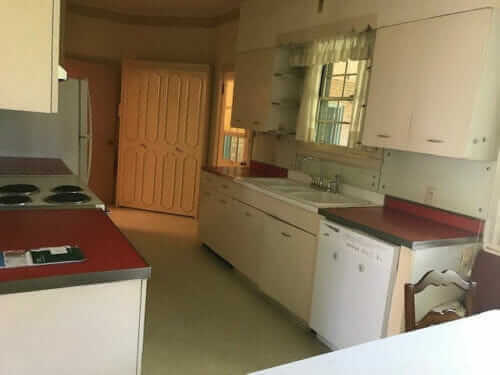 The 3,480 sq ft house features four bedrooms, three full bathrooms, one partial bathroom, and is listed for sale for $165,350. Above: I bet that’s original sculpted (patterned?) 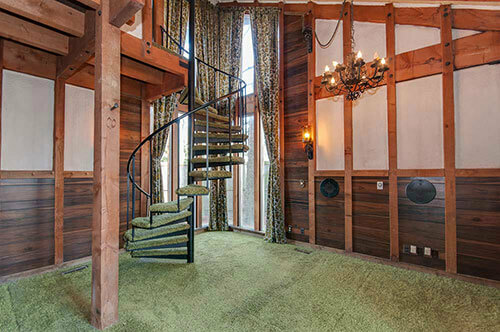 carpeting in this bedroom. Note, at the far left that looks to be an upholstered tufted headboard, with bed missing. 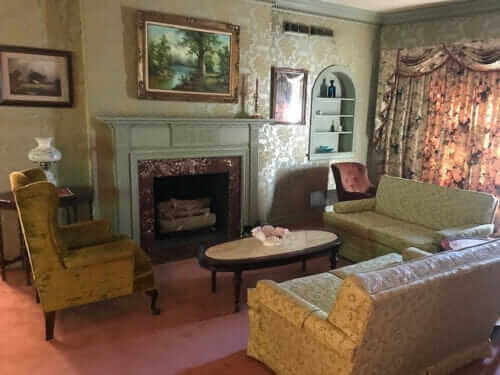 The color scheme: Lilac / green / muted coral would have been very classic 1940s heading into the early 1950s. 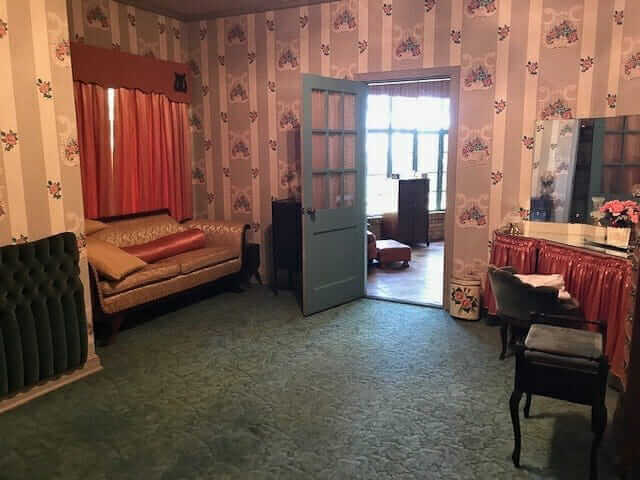 Above: This is the room visible from the lavender-wallpaper bedroom. All those rounded glass windows! This must have cost many pretty pennies in 1952. The tile floors look great, too. 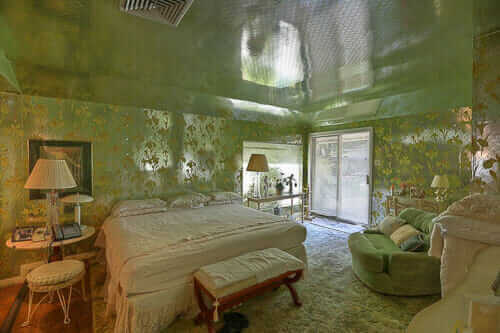 Above: I will guess that the wallpaper is not only metallic wallpaper, but also flocked. Yum. 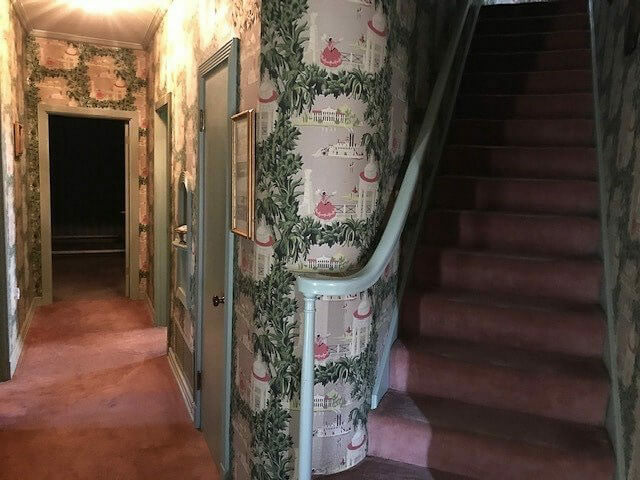 Another bedroom, I think… Again: THAT WALLPAPER! 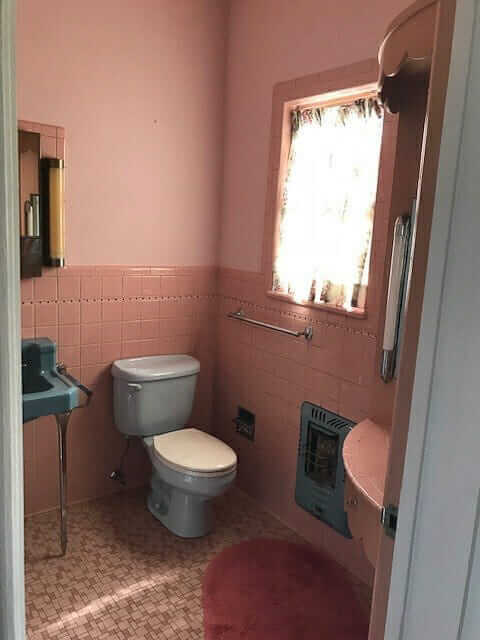 Above: The connected bathroom, be still our beating hearts. I can’t identify most plumbing fixtures by site, whose red is this do you think? Standard? Kohler? Crane? As Ann pointed out, the bathrooms are real gems. 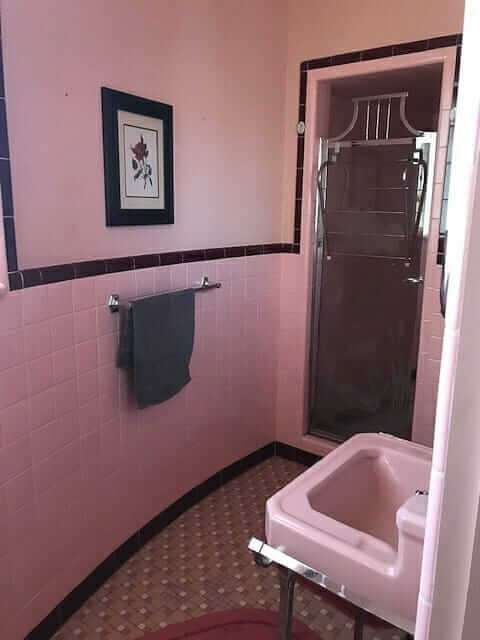 Above: Lovely pink bathroom — be sure to note the mosaic tile floor pattern, the fabulous shower door frame, and golly, the pink wall tile is tiled on a rounded wall! Above: The green bathroom is equally beautiful. Note how the designer set the sink on legs between two cabinets in order to create useful adjacent counter space. 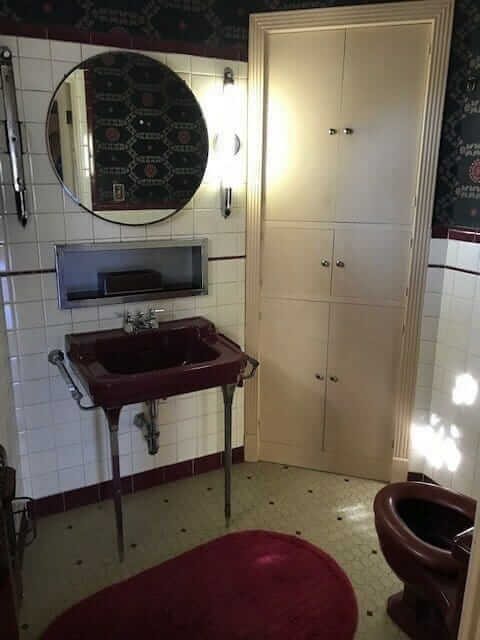 Above: yet another lovely vintage bathroom. 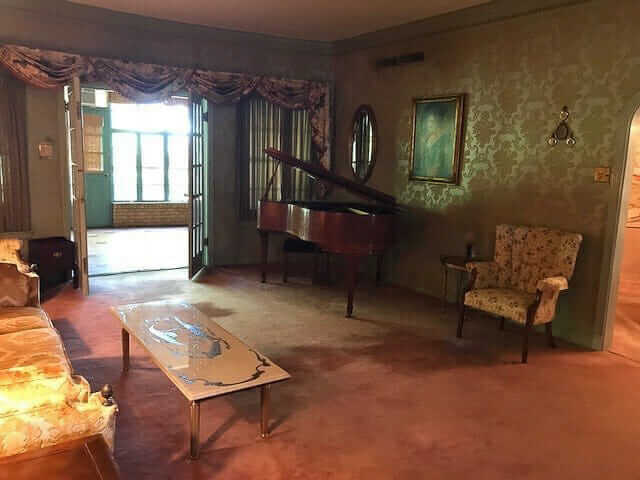 Note the circular dressing table built into the corner across from the toilet (far right of the photo). I’m saying: dressing table, because you can see the lights — I bet there are also mirrors there. Above: The kitchen looks all-original including steel kitchen cabinets and stainless-steel edged lamiante countertops. 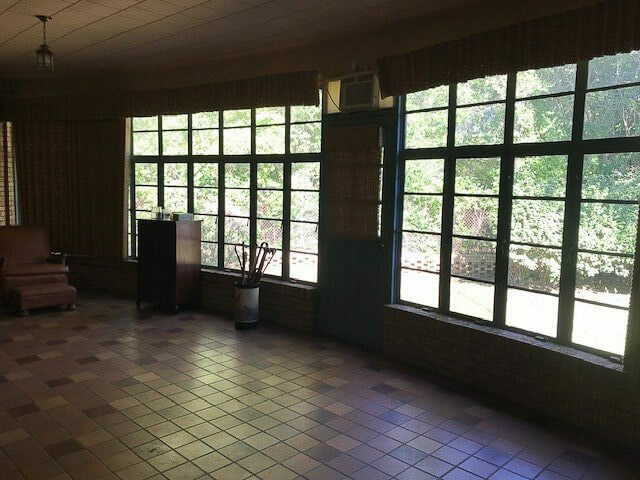 The appliances and floors look newer. Are those simply glass plates mounted on the backsplash? Hard to say. Interesting. 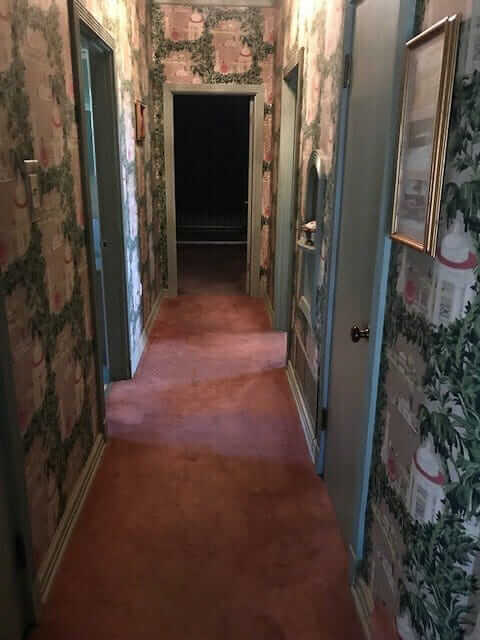 Above: Another shot of the hallway beyond the front entry, with that scenic wallpaper. I’m guessing all the paint trim is original — it’s inspirational to see wood trim painted a color besides white. What a wonderful house! Here’s hoping it finds appreciative new owners! 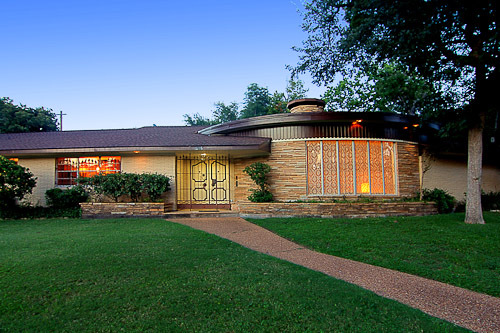 Listing from agent Tracy McKnight. The telephone nook in the 1926 duplex I live in has been turned into a message station of sorts.I keep a pen and notepad holder there, and it’s a good place to drop keys. The panel underneath the shelf has the original telephone wiring and bells inside. And yes, the house also has laundry chutes with two access points (inside the basement stair landing and the second floor landing), and some of the doors till have their original Art Deco-inspired doorknob plates. 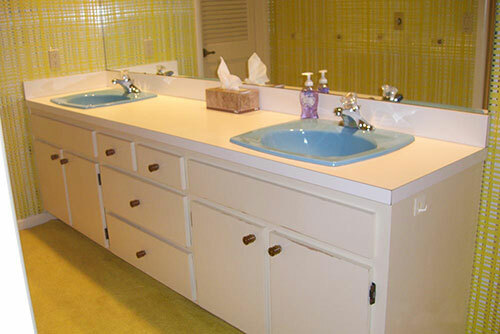 By the shape of the sinks, I’m voting Crane, as I had one that looked identical – only in yellow – in the first house I ever rented! I think I read that laundry chutes to the basement are against code. Would they survive inspection if an interior re-hab was done? One of the most practical features that probably kept a lot of people from falling down stairs while carrying a loaded laundry basket. I know i’ve wished for one since moving into this 1970s house with w/d in the basement. Yes, over the years I’ve also heard them may be against code (fire safety perhaps?). Check with your local building commissioner / building inspector! Love this! So creative and unique! I wouldn’t change a thing unless I had to. 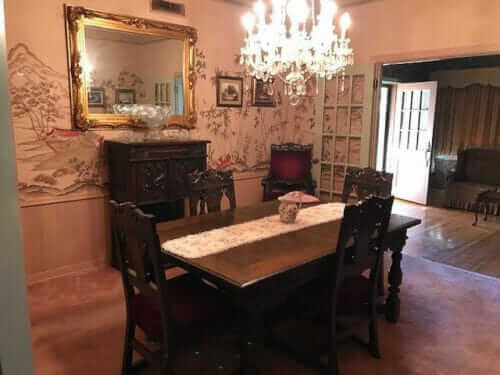 Agree with another poster that negotiating for the furniture as well would be something I’d try to do if I were to make an offer on this home. The whole place is so wonderfully expressive! Thanks, John V. — you are the expert!